In the no-man's land between the Bullring and Grand Central, in an awkward little corner where the two disputed territories meet there is now a barricade of brightly coloured crates. 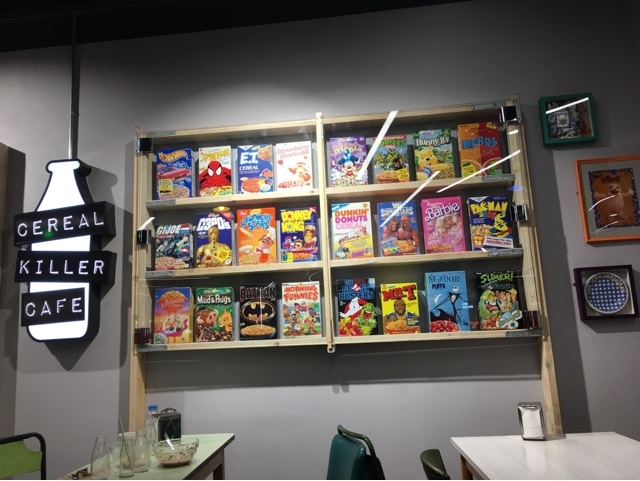 This creative distraction marks the edge of the Cereal Killer Cafe. 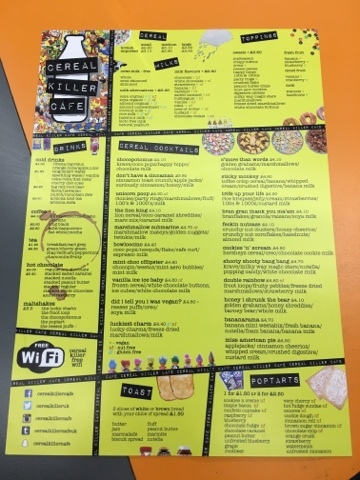 The idea of a cafe that serves predominantly cereal has been in London for a while, and merely laughed at through the pages of the Metro in the rest of the country. Now we get to see just what kind of person is happy to have a bowl of cereal in public and pay for the privilege. Keen readers will know that I am one of their target market, and that I don't need an excuse to eat cereal for all meals. For me it's not a fashionable hipster thing so much as a lifestyle choice. While my partner intervened when the private stash hit 24 distinct cereals (not including back-ups of staple cereals like Cornflakes & Shreddies), I now tend to float around a more manageable 8, not including all the varieties of jam filled wheats that she has. That said - I've tried a lot of the things on offer here, if not in all the odd varieties, so after a quick explore I decided to ask the staff to make a suggestion from the cocktail menu. 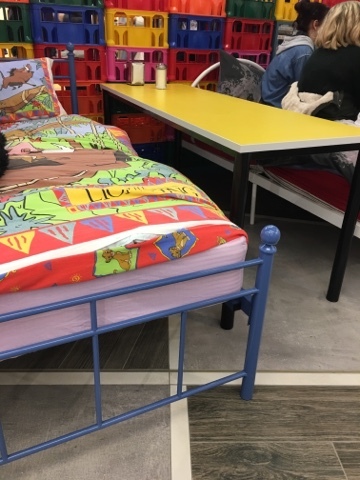 You can even eat cereal sitting on a child's bed. I wasn't tempted. The teenagers in the place seemed to love this idea so that's great as there were nice big tables for me. Here is my Medium bowl of Don't Have a Cinnamon which is a cocktail of 3 different cereals, cinnamon toast crunch, apple jacks, curiously cinnamon with honey poured on top. This would frankly be a great mix to eat dry as American cereals are closer to snack food than breakfast really. I did however pour the dairy milk on top to get the full effect. And it was pretty good - the apple really brought it together and the cinnamon is always a great taste. 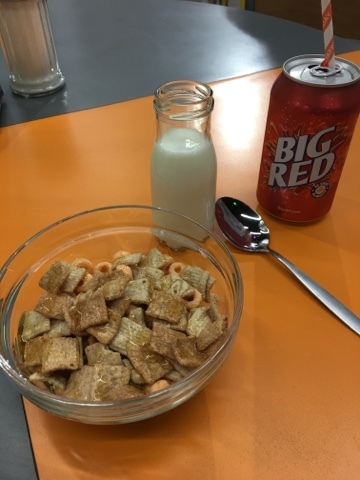 A good option for a cereal based lunch. 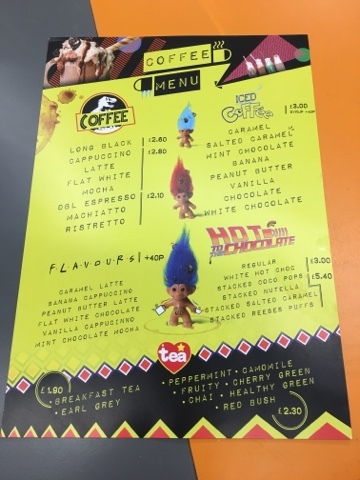 They have lots of options for return visits to suit a variety of tastes and budgets, but due to the American style diner attitude there is a massive amount of sugar on offer and little else. There are some bran and "raisans" options, but the reasonably healthy end of the shelf looked a little uninspired. There are also Pop Tarts for when cold sugar isn't enough and you want it superheated and dangerous. I'll surely try these on a future visit as like a lot of children of the 80s I wasn't allowed Pop Tarts when they launched. #DeprivedChild #FirstWorldProblems #TurnsOutTheyArentThatNice. Luckily the CKC have American flavours so bacon Pop Tarts and similar will be amazing. At least in theory. They have the usual drinks and some huge shakes that were popular with the younger visitors on the beds. I neglected to have a tea (as I was visiting my sister and tea was certainly in my future). 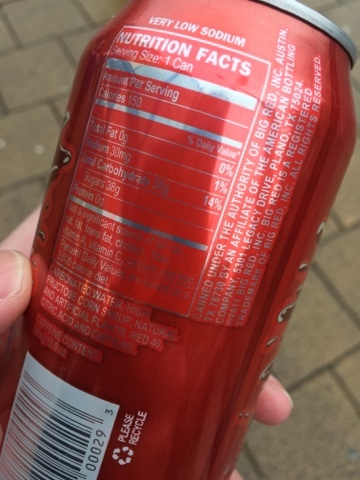 My meal together was £6 - but £2.20 of that was due to the Big Red, a drink i've not tried before and it's essentially a red Dr. Pepper. Naturally, being American, it's made from High Fructose Corn Syrup which is really disappointing to anyone who has had actual sugar and survived. Nice enough but not something I'd recommend. 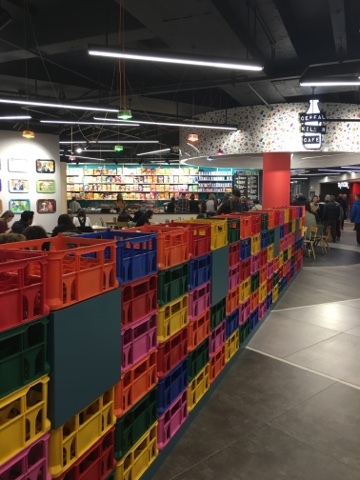 As a sensible place to have lunch it fails on almost every level, but as a place that generates nostalgia and fun experiences I don't think you can beat it (short of going to the Cadbury Factory Cafe). It has a mind boggling array of cereals (which only the most cynical and methodical would spot are mostly variants and just sugar) and frankly if I had the time and patience to go back and try all of the cocktails I would. Someone has genuinely spent a lot of time mixing and tasting these and almost every odd-ball suggestion I could think of for these was on the menu in some form. You can have Banana Milk, Custard Milk, Chocolate Milk and all kinds of non-dairy options for people like me who are branching out. I couldn't see a cocktail where they used fruit juice instead of milk, but I'm sure they did have one that was choc cereal and orange juice when I looked online (seriously - try cocopops/shreddies/orange juice). 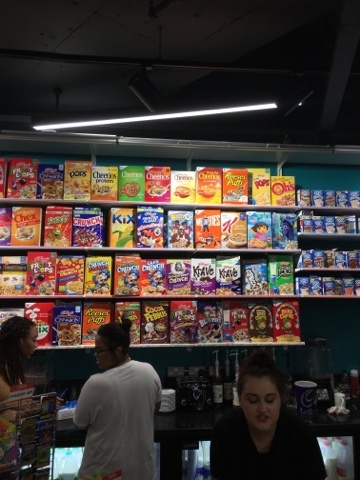 If I were the harsh judge on the Cafe based reality show though my complaints would be that they just don't have some of the amazing Indy cereals that we have here in the UK. Where was Lizi Shaw Granola? What about Bear! It's almost like they don't shop at Waitrose... They did have some Dorset Cereal which is probably the market leader, but I expected them to have a weird little corner of things I'd never seen before. I guess that the health conscious are really not the target market and it's about the treat experience so I really can't hold that against them. Brand names really are key, as Spiderman and Frozen cereals suggest. It's a great place then, and somewhere we are already planning multiple trips back to. My only hope is that they don't sell out of the few odd brands and variants that I do want to try before we make it there!